The Global Multi-resolution Terrain Elevation Data 2010 (GMTED2010) provides a new level of detail in global topographic data. The GMTED2010 product suite contains seven new raster elevation products for each of the 30-, 15-, and 7.5-arc-second spatial resolutions and incorporates the current best available global elevation data. The U.S. Geological Survey (USGS) and the National Geospatial-Intelligence Agency (NGA) have collaborated on the development of a notably enhanced global elevation model named the Global Multi-resolution Terrain Elevation Data 2010 (GMTED2010) that replaces GTOPO30 as the elevation dataset of choice for global and continental scale applications. GMTED2010 provides a new level of detail in global topographic data. The GMTED2010 product suite contains seven new raster elevation products for each of the 30-, 15-, and 7.5-arc-second spatial resolutions and incorporates the current best available global elevation data. The new elevation products have been produced using the following aggregation methods: minimum elevation, maximum elevation, mean elevation, median elevation, standard deviation of elevation, systematic subsample, and breakline emphasis. Metadata have also been produced to identify the source and attributes of all the input elevation data used to derive the output products. This new product suite provides global coverage of all land areas from latitude 84°N to 56°S for most products, and coverage from 84°N to 90°S for several products. Some areas, namely Greenland and Antarctica, do not have data available at 15- and 7.5- arc-second resolution. The 30-arc-second layer will only include the mean elevation and systematic subsample. Many of these products will be suitable for various regional continental-scale land cover mapping, extraction of drainage features for hydrologic modeling, and geometric and radiometric correction of medium and coarse resolution satellite image data. The global aggregated vertical accuracy of GMTED2010 can be summarized in terms of the resolution and Root Mean Square Error (RMSE) of the products with respect to a global set of control points (estimated global accuracy of 6 m RMSE) provided by NGA. At 30 arc-seconds, the GMTED2010 RMSE range is between 25 and 42 meters; at 15 arc-seconds, the RMSE range is between 29 and 32 meters; and at 7.5 arc-seconds, the RMSE range is between 26 and 30 meters. GMTED2010 is a major improvement in consistency and vertical accuracy over GTOPO30, which has a 66 m RMSE globally compared to the same NGA control points. In areas where new sources of higher resolution data were available, the GMTED2010 products are substantially better than the aggregated global statistics; however, large areas still exist, particularly above 60 degrees North latitude that lack good elevation data. As new data become available, especially in areas that have poor coverage in the current model, it is hoped that new versions of GMTED2010 might be generated and thus gradually improve the global model. Coverage Maps indicating the availability of GMTED2010 products are available for download. In addition to the elevation products, detailed spatially referenced metadata containing attribute fields such as coordinates, projection information, and raw source elevation statistics have been generated on a tile-by-tile basis for all the input datasets that constitute the global elevation model. EarthExplorer can be used to search, preview, and download GMTED2010 files. The collection is located under the Digital Elevation category. Below are other science projects associated with this product. Global 1-km digital raster data derived from a variety of sources. Shuttle Radar Topography Mission (SRTM) data have been enhanced to fill areas of missing data (Void Filled) to provide more complete digital elevation data with a resolution of 1 arc-second (~ 30 meters) and 3 arc-seconds (~ 90 meters) for global coverage. Below are publications associated with this product. Danielson, Jeffrey J.; Gesch, Dean B. 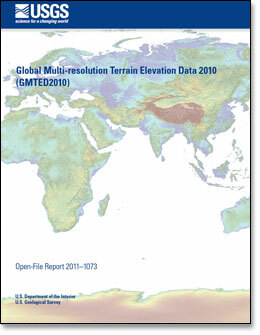 Global multi-resolution terrain elevation data 2010 (GMTED2010); 2011; OFR; 2011-1073; Danielson, Jeffrey J.; Gesch, Dean B. The EarthExplorer (EE) user interface is an online search, discovery, and ordering tool developed by the United States Geological Survey (USGS). EE supports the searching of satellite, aircraft, and other remote sensing inventories through interactive and textual-based query capabilities.